Named 2015 CD of the Year by Creative Child Magazine. Named one of the Best 10 Audio-Visual Programs of 2014 by Dr. Toy. Winner of a Mom's Choice Awards GOLD Award. Recommended by the Parents' Choice Foundation. Winner of The National Parenting Center's Seal of Approval. Winner of Dr. Toy's 100 Best Children's Products of 2014. Endorsed by KIDS FIRST! Winner of the Dove Foundation's Family-Approved Seal of Approval. Get ready to shout ¡Sabor! That's what people call out in Spanish when they hear great music. Once children sample these playful original songs and beloved family favorites, they'll want to sing and dance to them again and again (and they'll be learning Spanish as they do!) The latest release in the award-winning Spanish for Kids series, ¡Sabor! 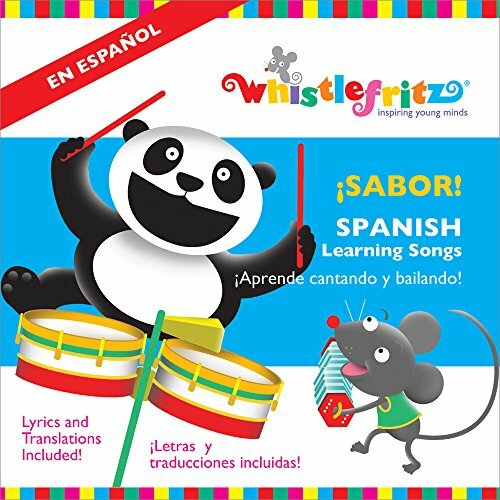 is a festive new collection of interactive Spanish learning songs with the emphasis on active, whether it's making animal noises, calling out responses, or shaking, hopping, and dancing. Internationally beloved singer-songwriter Jorge Anaya is your musical guide to this fabulous fusion of world music styles, including cumbia, calypso, salsa, and merengue, that keep the Spanish language-learning party going. From Uno, Dos y Tres and Mi Día (My Day) to En el Rancho de MacDonald (Old MacDonald) and Cuando Sea Grande (When I'm Big), each lively song introduces Spanish vocabulary for words and phrases children use every day. Get ready to be immersed in irresistible rhythms and pulse-pounding beats, and get ready to shout, ¡Sabor! Lyrics and translation guide included.